Business Insider/Sam SheadUberEATS delivery boy. Uber’s food delivery service got off to a rocky start in London as restaurants struggled to handle what is likely to have been a huge surge in demand. UberEATS, as the service is known, went live at midday on Thursday but within two hours people were experiencing issues with their orders. The vast majority of UberEATS users that Business Insider spoke to seemed to have a positive experience but some said their orders were cancelled and others said they’d received the wrong food. My own experience wasn’t without issue. I placed an order with Hotbox in Spitalfields via the UberEATS app but it was cancelled around 15 minutes later. I tried again and the same thing happened. Thankfully, my third order was a success. Altogether, it took around an hour and a half for my delivery to turn up. Hey @Deliveroo! @UberEATS refused to deliver to me and @amandakredman. We’re never going back but we’re starving. Please help. 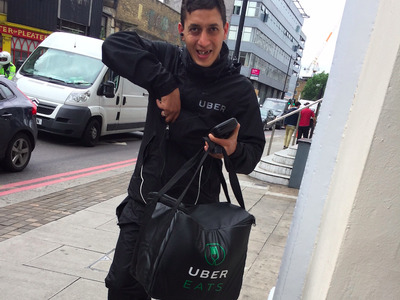 Another potential issue for Uber is the fact that a number of its early deliveries were made by people wearing the uniform of rival food delivery company Deliveroo. The food delivery cyclists that we spoke to earlier this month said they planned to work for Uber and Deliveroo or Take Eat Easy. Business Insider has contacted Uber and is waiting to hear back.